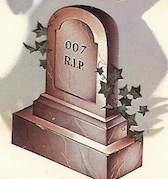 The HMSS Weblog (my go-to source for Bond film news, especially Bond 23 updates) has uncovered a fantastic letter Ian Fleming wrote to a fan who was concerned about James Bond's "death" at the end of the novel, From Russia With Love. Fleming responds with a bulletin from Sir James Molony, Department of Neurology, St. Mary's Hospital, giving an update on 007's condition. You can read the letter at the blog: Letters of Note. I think the fan is the mother of Simon Winder ,who wrote "The Man Who Saved Britain"
"After victory in World War II, Britain was a relieved but also a profoundly traumatized country. Simon Winder, born into this nation of uncertain identity, fell in love (as many before and since) with the man created as the antidote, a quintessentially British figure of great cultural significance: James Bond. Written with passion, wit and a great deal of personal insight and affection, this book is his wildly amusing attempt to get to grips with Bond’s legacy and the difficult decades in which it really mattered"